Four years ago, the Sportfishing Association of California (SAC), along with the “Let’s Talk HookUp” 1090 radio show, began visiting different regions of Mexico. 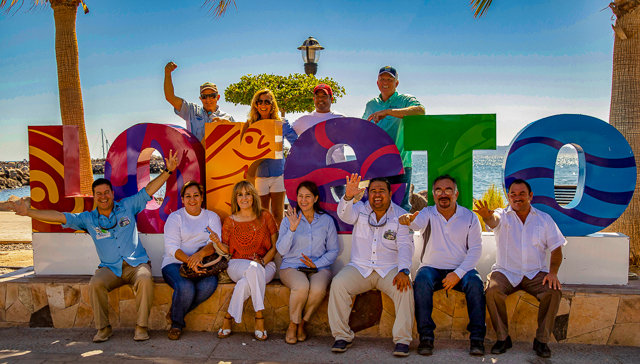 It was an effort to improve sportfishing communications between the local business owners, government officials and agencies throughout various Baja and Mexican Riviera Ports on the West Coast of Mexico and Southern California. This year, the series of visits were scheduled to begin May 17 with a trip to Mazatlán. SAC president Captain Ken Franke; Edwin Reyes, SAC Coordinator; Captain Tim Ekstrom; sound engineer Rick Cutler along with his wife Shannon, and I met in the SAC parking lot near Fisherman’s Landing in Point Loma at 6 a.m.
San Diego morning commuter traffic was light heading south toward the Cross Border Xpress (CBX) in Otay Mesa, one of the most unusual airport terminals in the world. It had welcomed more than 1.3 million customers in its first year of operation, and that was without any advertising! We arrived, unloaded, checked in, acquired our FMM’s and were marching across the US/Mexican Border in less than a half-hour. Then, a baggage glitch stopped the team in its tracks! 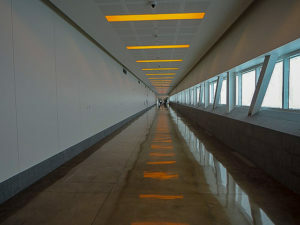 The trip to Mazatlán, where the remote broadcast was originally scheduled, was abruptly aborted. Disappointed, but not discouraged, the team simply switched the show’s location to the “Let’s Talk Hookup” San Diego Studio on the scheduled date. Capt. Franke, along with Capt. Ekstrom, arrived early for the May 19, 7 a.m. show at Pete Gray’s studio, eager to talk about Mazatlán and what it has to offer. 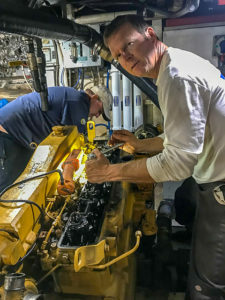 Ekstrom, owner of Royal Star, agreed that his 2018 plans for trips to Mazatlán had gotten off to a rocky start. tay tuned, there’s more to come! 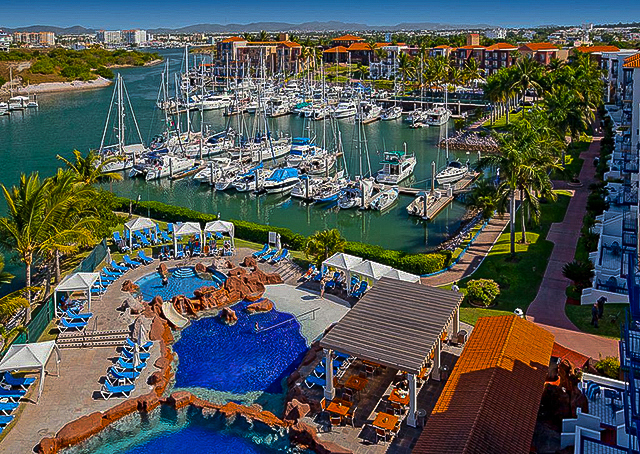 Making good on his commitment, he had scheduled several trips to the area this year, with Geronimo Cevallos, Manager, El Cid Marina and Aries Fleet assistance. Only to have one of the generators on his long range sportfisher fail just a few days before its scheduled departure. 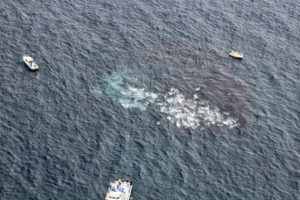 This was only the second time in his 30-year career that the boat had missed a scheduled departure because of an equipment failure, which required the rescheduling of the “four-day fly-down/fly-back trips” until 2019. He added that technical difficulties usually happen in twos and he was glad to have them behind him. 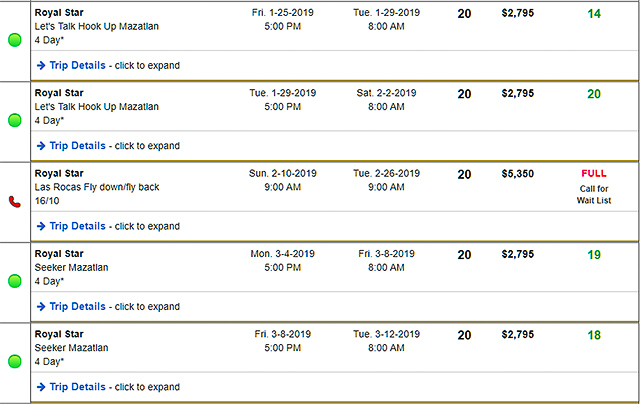 The remarkable response to the “fly down and back four-day trips” to Mazatlán has been overwhelming. Next year they already have trips scheduled at the end of January and March. “This is a new venture that is part of our future with lots of zones – and with a heck of a lot more there than is currently known. Using the Royal Star’s sophisticated technology, I can foresee expanding the opportunities in those zones offshore. Fishing yellowfin tuna weighing 200 to 300-pounds on flat water with little fishing pressure is compelling. “Operating out of El Cid, a world class resort centrally located in the city, I can’t imagine a better place on the West Coast of Mexico to base our operation,” concluded Capt. Ekstrom. Gray recalled his very first trip fishing in Mexico was in 1985 in Mazatlán and it was epic! It was in the spring and the marlin fishing was amazing; they have such a great “catch-and-release” attitude and very few billfish are taken anymore. They have done a great job of preserving that resource. is essentially the Mexican Department of Fisheries, the equivalent of National Marine Fisheries in the United States. When asked about (SAC) Franke explained, “Demographically the Sportfishing Association of California represents all the ports in Southern California, including 16 landings, that host 1.3+ million passengers this year on a variety of trips aboard dive boats, whale watching, sportfishing and more. “SAC was founded in 1972 by industry leaders speaking on behalf of their interests. It works with several agencies and stakeholders, including the California Department of Fish and Wildlife, U.S. Coast Guard, U.S. Navy, National Marine Fisheries Service, Federal Communications Commission, Congress, California Legislature, and the Mexican Government. SAC employees serve on multiple advisory panels in the state and federal arena and represent industry interests on a variety of topics. “Soon SAC will fund the eye-in-the-sky spotter plane piloted by Tim Green to assist SAC Fleet boats locating the schooling tuna throughout the summer season. “Fish Saver Descending Devices were promoted by SAC to ensure rockfish stocks remain healthy for years to come. 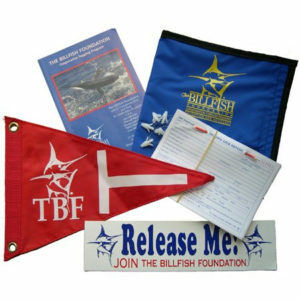 See their barotrauma information website to learn more about this condition that affects deep water species, and to purchase your own descending device. That has aided the 75 Fathoms Initiative and will be reviewed soon by CDFW. 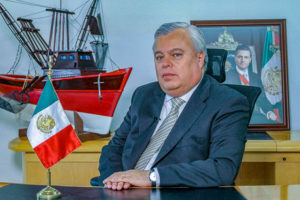 “Internationally, there is Mexican Government, CONAPESCA, Tourism Department, where most of our efforts in Mexico are to promote local sportfishing for the local communities. That’s why SAC funds the radio show series in Ensenada, Cabo San Lucas, Loreto and Mazatlán. Next on the schedule is Loreto in a few weeks where we will be meeting with state and local government representatives and observe a local sportfishing tournament and a chef’s cooking contest to crown the best chef in Loreto. 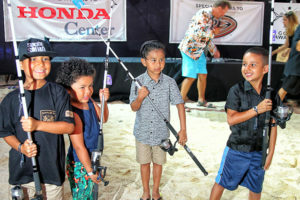 “In October, SAC will host a radio program in Cabo San Lucas and they have also donated 100 fishing rods to the Stars and Stripes Charity Kids Fishing Tournament on October 7. 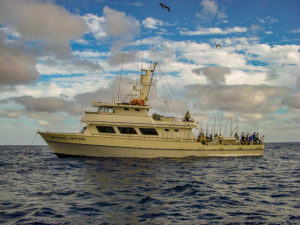 “There’s an impressive list of humanitarian efforts well beyond sportfishing,” Franke continued. “In conjunction with the San Diego CONAPESCA Office, they arranged for a truckload of tents to be shipped to survivors of the Mexico City earthquake. 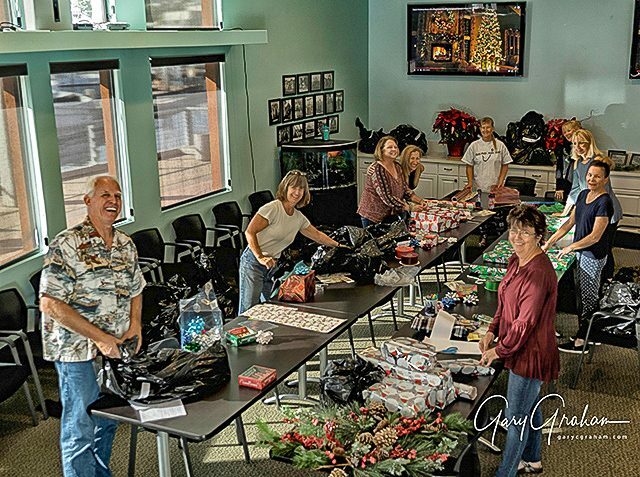 They are continuing the Children’s Hospital Delivery to the poor in Ensenada started by Bob Fletcher 20 years ago, and they also coordinate with Kathy Rounds Lo Preste on the Guadalupe Island Christmas gift project started by her several years ago,” Franke confirmed. Tom, from Long Beach, asked about RSW cooling systems used on many of the San Diego Fleet Long Range and local sportfishing boats. Ekstrom is one of the pioneers who introduced the RSW system, (Refrigerated sea water (RSW) systems chill fish through a mechanical process that pulls heat from the catch within the fish holds into an evaporator, then discharges that heat overboard through a condenser. 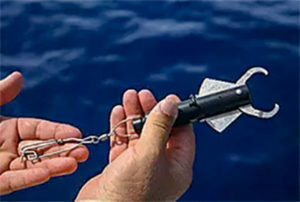 ), a game-changer that guarantees that your catch remains at its best on the boats, implementing the system in the fleet. 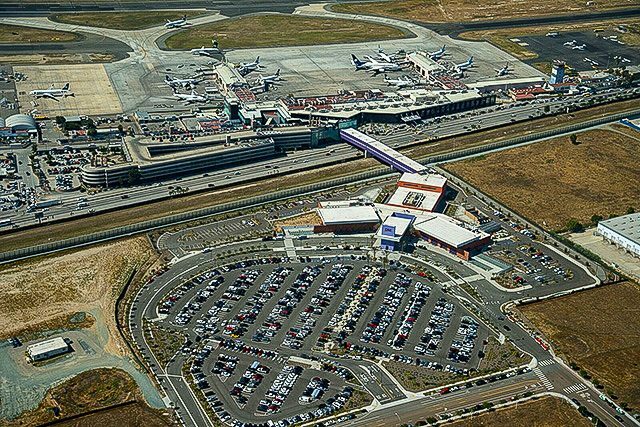 Ed from Mira Mesa inquired if there was any possibility the Mexican FMM rules would be changed to allow multiple entry instead of only being good for one trip. Franke responded that currently that was the law in the queue, but at this time FMM’s are only valid for one trip during their term of six months. He also assured Ed that parking at CBX was safe and reasonably priced. The next caller was Mario Gilberto Aguilar Sánchez. Franke introduced Aguilar as the National Commissioner of Aquaculture and Fisheries in charge of the planning, programming, organization and management of the National Commission of Aquaculture and Fisheries (CONAPESCA) – an office he has held since 2012. Aguilar expressed his appreciation for being on the show to speak to the sportfishing community. He was pleased to have SAC assist in the promotion of recreational sportfishing throughout Mexico. “CONAPESCA Office in San Diego just celebrated its 100th anniversary,” he continued. “It’s one of the oldest offices Mexico has maintained anywhere in the United Sates … a century of good relations with the citizens of the USA in a sport that we all treasure. “CONAPESCA’S ocean relationship with U.S. is one of our most important ones … we are on the same page, most of the time. “SAC membership has been very receptive. We appreciate and treasure our relationship with Ken Franke and SAC and consider the organization to be one of our most significant ‘across the border partnerships.’ We value SAC’s input regarding our fisheries management. 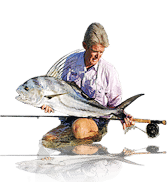 “We have a new website including paperwork and technology all about sportfishing, including an extensive list of species to be caught in Mexico. It also provides visitors the information they need for sportfishing in Mexico. This is unlike a century ago when all the paperwork was hard copies. Now, CONAPESCA has a state-of-the art, bi-lingual website. It has all the necessary forms needed by anglers along with instructions on how to complete them,” Aguilar concluded. Franke added. “Our two organizations share a mutual respect and we appreciate how accessible Mario Aguilar has always been. Good people. I have been in this job for 10 years and have found the CONAPESCA management and staff to be very approachable … especially Mario. “Mexico has amazing sportfishing resources that offer more than 200 sportfishing tournaments a year in some 250 sportfishing destinations throughout the country. Perhaps we could meet in Oaxaca on the mainland some time; we should try to meet and talk more frequently,” Aguilar interjected. The radio show provides marvelous opportunities to inform enthusiastic audiences with updated information about conditions and services offered along with other developments … all invaluable tools to listeners considering a trip to the various areas. 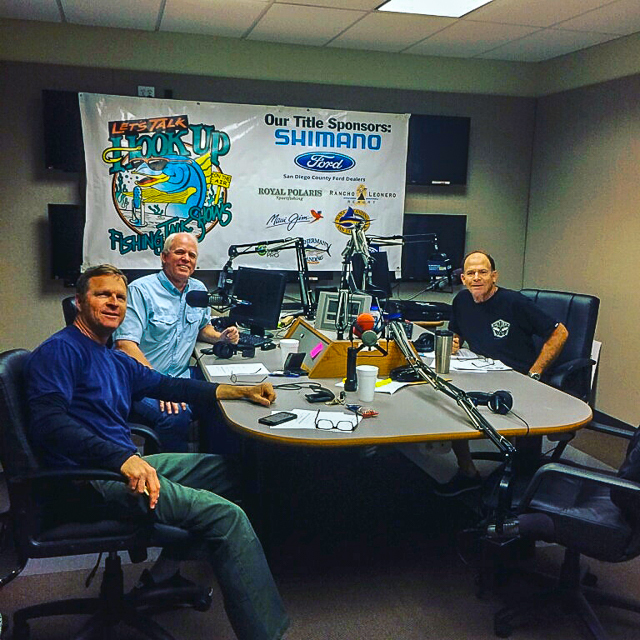 The panels on the show, with their chosen topics concerning the area, provide stimuli for conversations which often lead to the exchange of ideas among local anglers, attendees, visitors and listeners that might ultimately lead to solutions to sportfishing questions. Loreto is the next stop for the SAC team and radio show. To receive updated information on the interchange of ideas and developments between those who care about sportfishing in Baja and Southern California, dial in Let’s Talk HookUp Radio 1090 at 7 a.m. PST on June 2 with your questions and opinions. 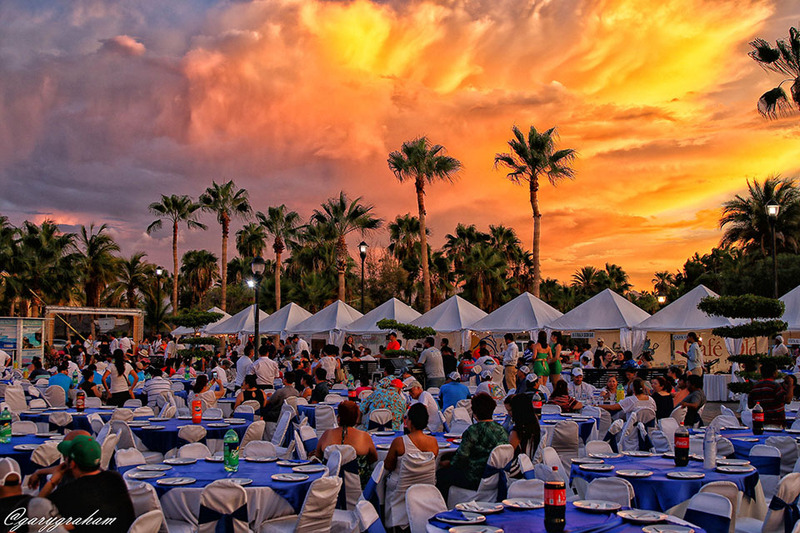 In conjunction with the 4th Annual Torneo Gastronómico that includes a one day fishing tournament and cooking competition among local chefs. Visit the links below for more information about SAC and for all Mexico sportfishing and travel questions. If you would like to hear the broadcasts, click on the links below.